The main mission of The National Agency for Employment and Skills promotion (ANAPEC) is not only providing employers with the right labor force and accompanying them in the recruiting processes but also strengthening the capacities of integration and accompaniment of the job seekers in the working life. Besides ANAPEC contributes, along with other relevant institutions, at structuring the labor market and developing its flow. Indeed, Anapec has established 74 local national agencies, ensuring; hence; a territorial coverage. To fulfill all these missions, ANAPEC relies on 613 highly skilled collaborators among whom there is 600 employment counselors. In order to go hand in hand with the increasing demands of manpower at the national and international levels, Anapec has developed a diversified database of 600,000 candidates from different field of activities(agriculture, agribusiness, fisheries, industry, textile, construction and civil engineering, industrial engineering, transport and telecommunications, health, tourism, hotels and restaurants businesses, computing, electronics, communication, logistics, trade and management, printing, etc). This database is continuously updated and contains various profiles. Applicants are financially responsible for airfare and accommodations. 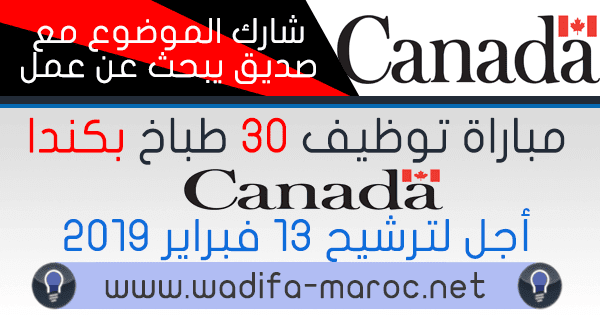 Employers will ensure to assist with planning flight dates and accommodations will be available upon arrival to Canada.